Note: Regions reflect U.S. Census regions. Biomass includes wood and wood-derived fuels, wood waste liquids, black liquor, sludge waste, agricultural byproducts, and other biomass solids, liquids, and gases. Biomass does not include biogenic and nonbiogenic municipal solid waste, landfill gas, and tire-derived fuels. Republished May 25, 2016, 3:00 p.m. to correct the units for electricity generation in the text and figures. Republished June 1, 2016, 10:00 a.m. to clarify the performance of Florida's Gainesville Renewable Energy Center. 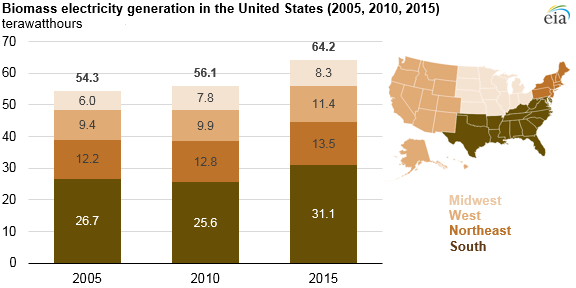 Over the past five years, U.S. electricity generation from biomass across all sectors grew from 56 terawatthours (TWh) in 2010 to 64 TWh in 2015. Much of this growth occurred in southern states such as Virginia, Florida, and Georgia. In 2015, electricity generation from biomass across all sectors accounted for 11.3% of renewable electricity generation and 1.6% of total electricity generation in the United States. Nearly half of the electricity generated from biomass in 2015 was at industrial facilities outside of the electric power sector, such as pulp and paper mills. Within the electric power sector, biomass accounted for 6.3% of renewable electricity and 0.8% of total U.S. electricity generation. Electricity generation from biomass uses several types of fuel, including forest wastes from clearing and thinning, sawmill residues, and urban landscape trimmings. These fuels can have widely varying physical properties and moisture contents, meaning biomass electricity generation plants often face unique fuel-handling challenges. Many power plants that burn biomass are cofiring plants, meaning that they use biomass as a partial substitute fuel. Several states, especially those in the South Census region, have increased their electricity generation from biomass. These states have ample forest resources, generally poor wind resources, and relatively unfavorable solar resources (compared to the Southwest), making biomass among the more readily available renewable energy resources in the region. Virginia has a statewide program to convert coal plants to biomass, with several plants that converted during 2013. Three of these plants, each rated at 51 megawatts (MW) and operated by Dominion Power, are located in Alta Vista, Hopewell, and Southampton. The conversions to biomass are part of Dominion's commitment to achieve Virginia's voluntary goal of generating 15% of its electricity from renewable sources by 2025. Also in 2013, the Northern Virginia Electric Cooperative (NOVEC) commissioned a 50 MW wood waste biomass plant in South Boston, Virginia. In 2012, Miller-Coors Brewing also opened a biomass-based electricity plant in Elkton, Virginia, to dispose of brewing wastes. Finally, an industrial plant in Altavista switched from natural gas to biomass as its primary fuel and upgraded capacity to add wood solids to its fuel mix. Increases in electricity generation from biomass in Georgia and Florida were each due primarily to a single new plant coming online. In Georgia, the 55 MW Piedmont Green Power plant began operation in 2013, fueled by urban wood waste and mill and logging residues. Georgia Power built the plant to improve its fuel diversity. Florida opened one of the largest new biomass plants in the United States, the 102.5 MW Gainesville Renewable Energy Center. The plant began generating power commercially in December 2013. The western part of the United States also had notable growth in biomass between 2010 and 2015, increasing electricity generation from biomass by 15% over that period. Most of the growth in the West comes from a few large plants in California that are helping the state meet its renewable electricity target.